Integral Molecular is a dynamic young biotechnology company that is committed to providing novel solutions towards the treatment and cure of human diseases. Their lead product, the Lipoparticle, allows researchers to manipulate a class of drug targets known as integral membrane proteins in ways not previously feasible. Since opening their laboratories in 2002, the Lipoparticle has undergone rigorous experimental validation, and is now commercially available. Integral Molecular have recently added the Labculture Class 2 biosafety safety cabinet model LA2-4A to their lab in Philadelphia. 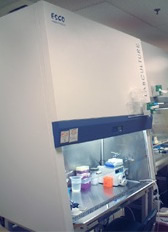 Previously they were using 2 biosafety cabinets from a competitor brand. We are delighted to welcome them in joining the hundreds across the US that have made the switch for a better product.